Why He's Amazing: The self-taught cook was brave enough to defy critics who said Dallas is a continental-cuisine town. His gorgeous dishes show off his insatiable creativity and curiosity: He'll turn his Christmas tree into pine tincture and pine oil to accent fried trout with smoked butter. Quintessential Dish: Smoked potatoes with maitake mushrooms and chile-spiked Kewpie mayonnaise. 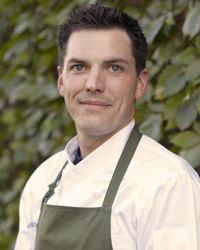 Restaurant CV: Stephan Pyles, Dallas. Inspirational Cookbook: Essential Cuisine by Michel Bras. "It was a game-changing book for me. I got an out-of-print first edition; I dropped $400 on it. I don't really read cookbooks—I don't think I've ever even made a recipe out of a cookbook—but I look at the pictures in the Bras book, and every once in a while, I'll find a technique that gets the ideas flowing." On FT33's Design: A lot of the wood inside the restaurant came from a 19th-century stable at Sterling Lamb at Hodges Ranch, in West Texas, where McCallister also gets his lamb. Favorite Oddball Ingredient: Shiro kikurage, a white fungus that grows on trees. He likes to rehydrate the dried fungus and infuse it with black truffle for a rich lamb broth. First Job: "I started out cooking at a family-run restaurant in Scottsdale, Arizona, called Guido's when I was 15, but I never really took it seriously. [My parents were] like, 'You need to go get a job.' So I was like, 'OK, I'll go get a job.'" On Working at Stephan Pyles: "I was 25 when I started at Stephan Pyles as a pantry cook. I didn't have formal training and always felt behind, so I stayed up late nights reading, studying and trying new recipes to try to catch up." FT33's Design: "Barnyard industrial." A lot of the wood inside the restaurant came from a 19th-century stable at Sterling Lamb at Hodges Ranch, in West Texas, where McCallister also gets his lamb. Favorite Oddball Ingredient: Shiro kikurage, a white fungus that grows on trees. He rehydrates the dried fungus and infuses it with black truffle when making a "really rich lamb broth."